The CS is one of our best apps. By purchasing this app, you can get more earnings. From our CS service, 70% of our users are satisfied. You can review all the features of the application here. What are the privileges of our CS users? First of all, the CS application has a completely different design. You will feel special. In addition, CS users receive 80% faster response from the support system. We are doing our best to make you feel special. In addition, CS users can communicate with our management team via the WhatsApp line. What are the features of the CS application? In the CS application we share 4-5, sometimes more tips on a daily basis. All of the tips are carefully prepared by our expert analysis team, especially Selim Tekin. The total daily odds is + 200. And please note that shared estimates in this application are not 100% guaranteed. Yes, this is one of the most asked questions. The CS application does not work with the subscription system. By paying only once, you can use the CS application for lifetime. 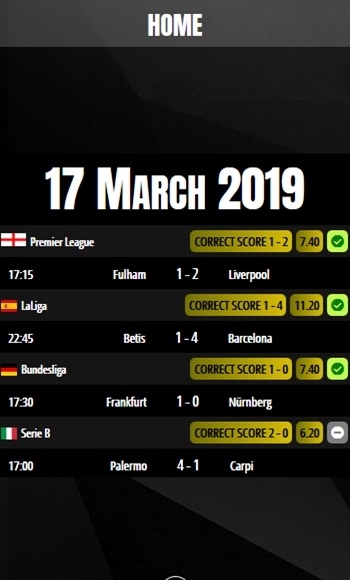 I've used soo many beting apps buh, ( MAGICAL TIPS ) is fantastic among them all ,God bless the developers of this wonderful app. You are truely magical. I feel like giving you people 3000 stars you soo fantastic LUV YOU!!! I've allready given you all my stars, Great app. Thank you very much for your support. We're trying to do the best for you. Because you deserve the best. Welldone guys.. Keep on the good work.. Excellent app, easy to use and help in making cool cash. this app is the best i will always i mean always use it. Pay one time, use the lifetime.